New Life for an Old Floor | Blackwell's Inc.
We've all probably wished for a chance to get a new look. But the older I get, I've come to realize it's just not going to happen. But with an old concrete floor, some dramatic changes can happen. 80 year old concrete floor cut into 8 in tile and polished. 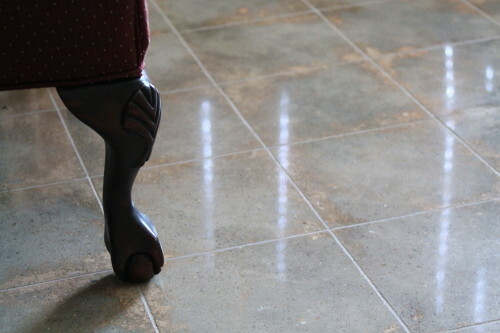 The light, irregular areas on the floor is the result of "ghosting". Take this 80 year old concrete floor. It was at one time in its life, covered in vinyl composition tile (VCT). After removing the tile, the irregular and lighter outline of the tile, known as "ghosting" remained on the floor. There's not much that can be done to remove the ghosting, but it can be masked so it's not quite so noticeable. To mask the ghosting, we cut the floor into perpendicular lines the size of the original VCT and then polished the concrete to a high sheen. The result is an old floor with the new look of polished marble tiles!